Battle giant robots, mad gods, and…awkward teen romance? You were just an ordinary high-school student—up until you rescued a mysterious being from the army, and were granted amazing powers! Now you must put on your colored costume, make sure to finish your homework, and prepare for the fight of your life! It’s 40% off until April 11th! 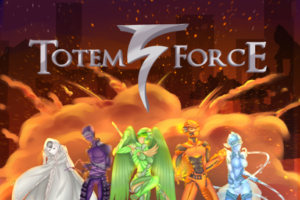 Totem Force is a lighthearted 260,000 word interactive anime-inspired novel by Tom Rayner, where your choices control the story. It’s entirely text-based—without graphics or sound effects—and fueled by the vast, unstoppable power of your imagination. • Play as male, female, or non-binary; gay, straight, bisexual, or asexual. • Romance your jerk rival, the mysterious blonde, your childhood best friend, and many others. • Solve your problems with friendship, or use your own intellect and willpower. • Defend the city from monster attacks! It’s time for you to become the Heir to the Heavens! Tom Rayner developed this game using ChoiceScript, a simple programming language for writing multiple-choice interactive novels like these. Writing games with ChoiceScript is easy and fun, even for authors with no programming experience. Write your own game and Hosted Games will publish it for you, giving you a share of the revenue your game produces.